Wellness in the workplace is a hot topic. Many employers have embraced health and fitness programs. They know that healthy employees are more productive and less expensive. Setting aside the workplace, we all yearn for a healthy body and mind. Most of us think about it every day. Yet, by and large — so to speak — Americans seem to be growing bigger and getting more sedentary. What gives? The USDA recently released a new set of “nutritional guidelines” just as it has every five years since around the time President Reagan proclaimed ketchup a vegetable. Obesity has more than doubled, and now even affects young children. At least 75 percent of the population is overfat (those who have excess body fat but don’t qualify as obese). Heart disease, stroke, hypertension, high blood fats and other disease risks and chronic illnesses have risen dramatically. Diabetes has exploded, with more than half of Americans suddenly suffering some form of it. U.S. healthcare costs have more than tripled since 1980, and this year are estimated to reach $4 trillion (about $50,000 for a family of four). In his article Death by Dietary Guidelines, Dr. Maffetone chronicles what might happen to his good health if he blindly followed the US guidelines for a year. His hypothetical reveals the dangers of eating poorly. A large, framed poster of Winston Churchill hangs behind my desk at work. It depicts Churchill pacing aboard a ship in the windswept North Atlantic in 1941 — when England was near defeat to Nazi Germany. Across the room hangs Jack LaLanne’s equally inspiring poster. In it, he grins broadly, a man in his 80s lifting weights in his iconic jumpsuit. Every time I walk to my desk I see Churchill battling the wind and elements. And when I sit down and look up I see a spry octogenarian grinning ear to ear — living his dream. These images are symbolic reminders to stay strong, make the right choices, and occasionally have a laugh while you’re at it. They are part of the deeply embedded work “culture” at Bourque Law Firm. We go to work to work. While there, however, couple your work ethic with broader concepts — including those that ensure the vitality of your physical and mental health and well-being. As I wrote here, industry leaders like Able Engineering make it their business to ensure their employees’ health and wellness. Able’s Total Wellness program arguably sets the standard in the industry. However, not all employers will have the wherewithal to implement the kind of system which exists at Able. For these employers it is critical to do something to help employees obtain, maintain and/or regain their physical and mental health. Call me and we can go for a walk, run, lift some weights, do some tree pull-ups, or throw a Frisbee or football — all the while sharing ideas as to how each of our workplaces and households can get better. I’ll buy the drinks afterwards, and they will not include Gatorade. We all need more than luck in our quest for health and fitness. Increase your company’s odds of having healthy employees by starting or enhancing a health and wellness program. The same principle applies to all employees reading this article. Start your wellness at home and bring it into the workplace, or vice-versa. You need not overhaul everything at once. Engage in what the Japanese call “kaizen”: continuous improvement. Winston Churchill, on the other hand, lived to the ripe old age of 90 despite having champagne for breakfast and often imbibing other spirits throughout the day and night. And, he lead England in almost singlehandedly holding-off Nazi Germany before the United States and Russia entered World War II. Churchill’s nation-saving achievement came shortly after he had been laughed out of government for warning of Hitler’s emerging threat. Read The Gathering Storm if you want to understand Churchill’s greatness (caveat: it is not a short read). 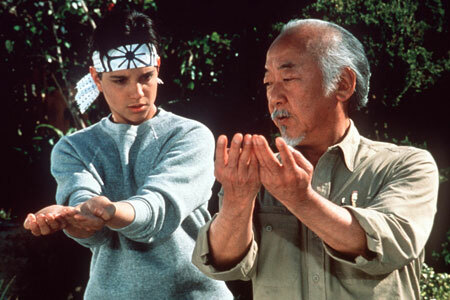 The Karate Kid is one of my favorite movies. The 1984 classic delivers lesson after lesson: be humble; stay mentally strong no matter the opponent; confront your fears; do not quit; good things come from hard work; do not be afraid to try new things; and on and on. This edition of the HR Law Insider focuses on keeping your business out of Miyagi’s “middle lane” in 2016; it shares eight things you should be doing to ensure that your business is squared away for the year. Are your independent contractors truly independent — or might the Department of Labor (DOL) consider them employees? Do your salaried, exempt employees truly fall under one of the Fair Labor Standard Act’s (FLSA) exemptions (e.g. administrative, executive, professional, etc.)? Are your written job responsibility documents consistent with your classification? In my experience, the number one cause of lawsuits and government audits and investigations is poor employee morale and/or poor lines of communication within a company. Constantly assess employee morale. Always ensure employees — from janitors to supervisors — are heard and do not fear retaliation for bringing issues to management. Various laws protect sick, injured, and/or pregnant employees. Yet, on the other hand, employers have a business to run and need to count on employees to come to work. When an employee’s need for time off conflicts with an employer’s need to run its business, oftentimes a difficult decision must be made. When such a decision involves disciplining or terminating an employee, consult counsel to ensure that there is no violation of, for example, the Americans with Disabilities Act (ADA), the Family Medical Leave Act (FMLA), and the Pregnancy in Discrimination Act (PDA). In sum, a little thoughtfulness goes a long way in avoiding discrimination claims brought by sick, injured, and/or pregnant employees. Failing to identify and correctly answer these questions can result in a bad 2016 — and beyond. The tips listed above will help ensure that your business has a solid 2016. Put the proper systems in place, execute consistently, and your business needn’t fear getting crushed in Miyagi’s middle lane.